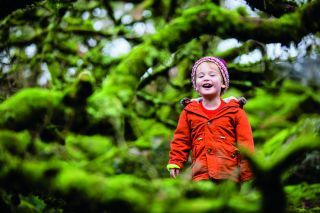 Walks in the woods offer plenty of opportunities for great portraits, both of kids and adults. The landscape of the forest throws up a pleasing array of colours, organic shapes and varying light that can be used to the portrait photographer’s advantage. We went to Wistman’s Wood in Dartmoor for our shoot here; this atmospheric forest of stunted oak trees in the heart of the Devon countryside is a great place to shoot your portraits. But no matter what type of forest you choose for your shoot, they all share certain features that can make for a variety of interesting compositions in portraits. When photographing people in woods, there’s always a danger that the frame can get too busy. A wide expanse of trees may be pleasing to the eye, but when it comes to portraits, an overload of detail can be to the detriment of the subject. The key here is to find ways to simplify the scene and draw the eye in towards your subject. In this tutorial, we’ll explain a few ways in which this can be done. You could, for example, use a wide aperture for a shallow depth of field so that the foreground and background branches are blurred. Or you could compose the image so that the surroundings work in harmony with the subject. Useful compositional tricks, such as the rule of thirds and frames within frames, are also a big help, as they can help you to visualise a tangled mess of branches into an arrangement that works for your portraits. With a little practice, these skills soon become second nature. Portraiture is about creating a connection with your subject, and camera height plays a part. Try shooting slightly below eye level to make a person appear more dominant, or getting down lower to see the world from a child’s viewpoint. For a simple exposure setup for woodland portraits, set your camera to manual exposure mode and then set ISO to Auto. You can now choose a shutter speed and aperture while the camera works out an ISO to suit. We need a fast shutter speed of at least 1/250sec for handheld portraits, especially when using longer focal lengths. Light levels can be low under tree cover; a wide aperture such as f/4 or f/2.8 will give you a shallow depth of field, while also enabling you to shoot in lower light without having to push the ISO too hard. One great compositional trick is to find a natural frame that you can incorporate within your frame. Look for branches and boughs that curve around, or gaps in tree trunks and bushes. Shoot through them or ask your subject to pose by them so that they appear framed. Creating depth in your portraits is a great way to add to the magical atmosphere, and helps to lead the eye towards your subject. Find an angle to shoot from that enables you to include some out-of-focus details in the foreground as well as in the background. Under a canopy of branches there's a lot of variation in the light, even on a flat, cloudy day. If your subject’s face is in shadow, look for another angle or ask them to turn towards the light for better illumination. Portraits are, after all, about the person, so we need to see them. Choose outfits with blocks of strong colour that contrast with the surroundings. In the woods, stay away from greens, browns and other camouflage colours. Warm colours, such as orange and red, are opposite to cool hues of green and blue, so these will draw our attention best. Trees and branches form wonderful web-like patterns in old woodlands or forests, so look for parts of the scene where you can show this off. There’s a danger of the frame looking too busy with these interesting backdrops, so try simplifying things with a punchy mono conversion. you don’t want one appearing to sprout from their head!